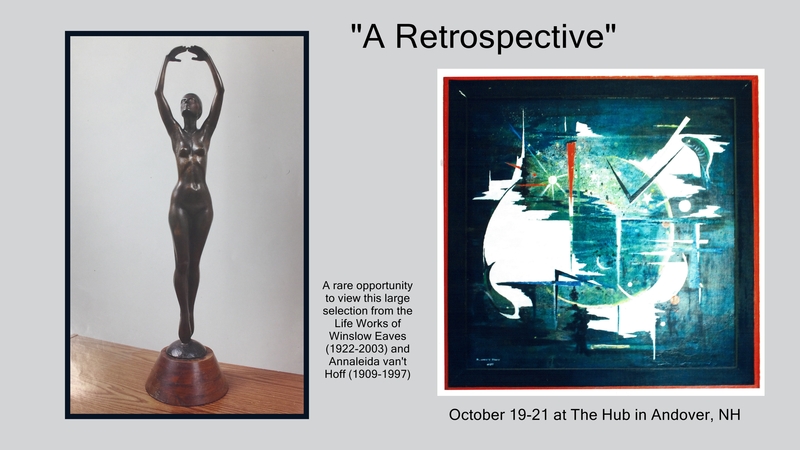 The Andover Historical Society presents “A Retrospective,” an all-new art exhibition featuring life-works of renowned Andover sculptor Winslow Eaves (1922-2003) and painter Annaleida van’t Hoff (1909-1997). This weekend event is being held October 19-21 at the historic Andover Hub (once Andover’s town hall), 157 Main Street, Andover, N. H.
There is a ticketed opening gala reception at The Hub on Friday evening, October 19, from 5:30 to 8:30 p.m. Hearty hors d’oeuvres and libations will be served. Tickets are $60 each—reservations are requested no later than October 17. Tickets may be purchased at andoverhistory.org, on the Historical Society’s Facebook page, or by calling 603-498-6439. On Saturday and Sunday, October 20 and 21, the exhibition is free and open to the public from 9 a.m. to 5 p.m. In addition to the combined 70-plus selected works, some of Eaves’ tools, moulds and early pieces will be on display, as well as early studies of van’t Hoff. A multi-media presentation also depicts the lives and works of these two internationally distinguished artists. van’t Hoff’s former home and studio will be open to visitors on Sunday, October 21, from 1 to 3 p.m. Special guided tours of the exhibition for local students are also being arranged. Through this exhibition, the Historical Society seeks to celebrate Andover’s rich and historic tradition of supporting art in the community. Exhibit curators Gail Richards, Patty Eaves, and Susan Schnare have selected each piece from many private collections to best represent the numerous mediums and varied styles of both artists. Patty Eaves, daughter-in-law to the late Winslow Eaves, says, “I’m thrilled and honored to co-curate this exciting exhibition that is dedicated to two artists I knew and loved. More information at andoverhistory.org. The Andover Historical Society is a 501 (c) (3) non-profit organization established in 1983. To learn more about the Historical Society, visit www.andoverhistory.org. All proceeds benefit the Andover Historical Society. Image from the Andover Hub.